Home / Recipes / Autumn Series 2018 / Pumpkin and Mushroom Risotto – Easy and Delicious! Pumpkin and Mushroom Risotto – Easy and Delicious! 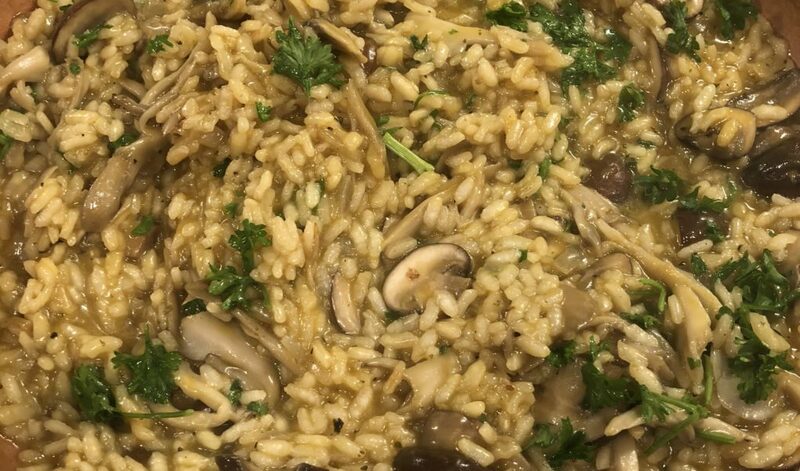 by Janani Kumarupdated on October 17, 2018 October 17, 2018 4 Comments on Pumpkin and Mushroom Risotto – Easy and Delicious! Hello, vegetarian carnivores! I know I have been off the grid for the past week – sorry! I was going to make this recipe last week, but the knife slipped and I cut my finger pretty badly and one week later it is still healing. PSA: always be careful with your tools! Anyone, regardless of how often they cook, can fall victim to this very simple mistake. It was a nasty cut and I avoided my knives like the plague for a few days. But not anymore! I managed to make the recipe without cutting myself this time. As you all know, I am conducting an Autumn 2018 series right now with a focus on, you guessed it, all things fall. And it has been going incredibly well so far – I have recipes up for a creamy pumpkin sauce, which I paired with cheese ravioli, refreshing rainbow pasta with yams, as well as a “chicken” and mushroom tagliatelle so far. And I am delighted to share another recipe with you today for a very delicious pumpkin and mushroom risotto. Like most of my other recipes, this one is easily made vegan with one easy substitution, which I have included below. It is also important to note that this recipe stores and reheats very well, with the addition of water, to adjust the consistency and prevent the dish from getting dry. 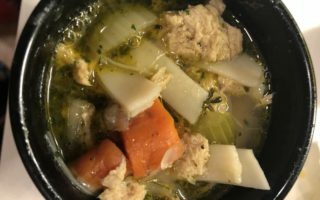 I have included no salt in this recipe on purpose – the broth I used actually had adequate salt and I did not want to risk going overboard on it. Remember: always add salt at the end after tasting, to make sure you don’t add too much. When I first posted about my pumpkin sauce ravioli, I got such an incredible response on all forms of social media, from Facebook groups, to The Vegetarian Carnivore’s Facebook page, right down to the website comments. You all left me such wonderful comments and requests to post more recipes with pumpkin that I just could not refuse! Pumpkin, as you already know, is one of my most favorite vegetable of the fall for a bunch of reasons. First of all, it is easy to come by. I know a lot of people shy away from using pumpkin in their cooking because it can be daunting to deal with a giant vegetable that you just don’t know what to do with. During this season, if not year round, mostly all stores in the United States sell pure canned pumpkin puree. This is what I use in most of my cooking, unless my recipe calls for chunks of pumpkin, in which case I do deal with whole pumpkins, which actually is not as bad as it seems. But I digress. The second reason that I am so obsessed with pumpkin is its sweet flavor. Many of you know pumpkin pie as being very sweet, almost cloyingly so sometimes. However, pure unsweetened pumpkin puree has a mildly sweet flavor – perfect for adding to savory dishes as a pop of flavor. And this is perfect for my cooking because I am crazy for savory dishes. While I definitely enjoy desserts and other sweet goodies, I have a very low sugar tolerance and can only have mildly sweet desserts. But as for savory dishes, this mild flavor complements the nutty, spicy, and warm notes, when used in moderation. Moderation is key, as a little of pumpkin puree goes a long way. This recipe only uses half a cup of it, but yields such a beautiful result. Put your hands up if you love mushrooms! *Raises hand* Mushrooms are one of the best additions to dishes, and even the centerpieces to their own dishes. They are versatile, require very little effort to cook, and each have a distinct flavor, making the possibilities virtually endless. You are probably familiar with button, portobello, shiitake, and maybe a few other kinds of mushrooms. And one of the mushrooms for this risotto is button. However, we are also going to use another mushroom for this recipe, one whose texture really lends itself well to create a sharp contrast in taste and texture in this dish. It is known as maitake, or hen of the woods. Maitake mushrooms are hailed for containing powerful antioxidants, trace vitamins and minerals, and amino acids, all of which aid in good health. They are also suspected as an effective cancer fighting natural weapon. Finding maitake mushrooms was not too difficult. I got mine at Whole Foods. While I do not advocate for getting all your regular groceries at Whole Foods (I once saw a cauliflower head for literally 6 dollars), I do recommend it as a great resource if you are trying to hunt down a very specific ingredient for a dish or if you need a specific variety of mushroom or brand of some good. 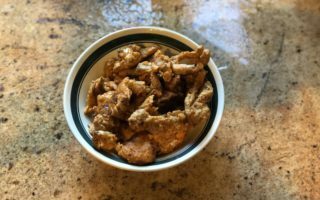 I am actually really impressed with Whole Foods’ mushroom selection – they really have a lot plus a ton of mushroom medleys that allow you to taste a variety and establish your favorite. Anyway, I got my maitake fresh (not in a package) directly from one of their bins. I also got arborio rice there, because I wanted actual risotto rice, not just any random “short grain” rice. 2-3 cups extra water, to adjust consistency. In a large saucepan, melt in butter and olive oil. Saute in both kinds of mushrooms and cook thoroughly. Stir in pumpkin puree and mix well. Slowly, add in the broth, cup by cup, stirring and mixing until absorbed. If the risotto is too dry after the rice has absorbed all the broth, add water and mix until you have reached desired creaminess consistency. Add in fresh cracked pepper and fresh parley for a pop of color. Mix well and enjoy! Or store in fridge for up to 5 days and reheat with more water to prevent drying. Doesn’t that just look absolutely delicious? It tasted delicious too – with the nuttiness and earthiness from the mushrooms, to the mild sweetness of the pumpkin puree, this is definitely a recipe you don’t want to miss! Let me know in the comments below how this one turned out for you! And be sure to let me know what you would like to see next on The Vegetarian Carnivore! 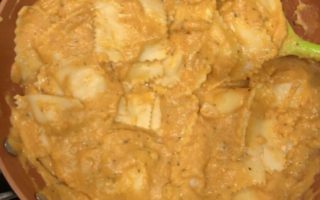 Pumpkin Ravioli Sauce – To Kick Off October! Thank you for this great recipe regarding pumpkin and mushroom risotto. I really like the taste of risotto, but I am a busy working mother so I don’t like cooking risotto very often because of the amount of time that it takes to slow cook the cook and add the liquid slowly. I read over your recipe and I couldn’t work out how long it took you to cook this dish. How long did all that liquid take to absorb? I like that you really like mushrooms at this time of year, my youngest doesn’t like mushrooms. What is your #1 substitute vegetable to use instead? Hi there! So glad you asked this question because I made this in less than 30 minutes! The mushrooms sauteed quickly (about 5 minutes) and once i mixed in the pumpkin puree I directly added in the rice and started with the broth. I would say around a couple of minutes with each cup of broth… so relatively quickly on medium high heat! It is an active process though, so it is not a “set and leave” kind of recipe. If mushrooms aren’t a hot favorite with your kids, then I recommend some other tender and fleshy vegetable, like squash or even eggplant! After reading your recipe I am salivating! I make a mean mushroom risotto but never thought of expanding it to include pumpkin. I use fresh pumpkin when I do use it in cooking. I often roast it first. Now what do you think roasting the pumpkin will do to this risotto? I think it would be so yummy. I noted your remark about the pumpkin pie. My mum used to add a banana to the pumpkin and that really smoothed it out and modified the sweetness. I would love to try maitake mushrooms but need to go on the prowl to find fresh ones in Tasmania. I expect someone has them. So my new recipe for the week is this risotto. Thanks for making me aware of it. Thank you so much for your comment and I am excited for you to try out this recipe soon! Roasted pumpkin pureed in a food processor would definitely add a beautifully rich and earthy tone to your dish! I say go for it! Hope to see you back here soon for more of my recipes! !